Art Intersection will be exhibiting photographic work dating from the mid-19th century through the 21st century. Examples of many of the medium’s most celebrated processes will be displayed including, daguerreotypes, platinum/palladium prints, photogravures, and gelatin silver prints from some of the most prominent photographers of the past centuries. Vintage works by Eugene Atget, Paul Strand, Alfred Stieglitz, Harry Callahan, Aaron Siskind, as well as the work of many notable contemporary photographers has been loaned to us courtesy of Northlight Gallery, School of Art, Herberger Institute of Design and the Arts, ASU; Jeremy Rowe, and Tilt Gallery. An arrangement of selected tri color gum bichromate, platinum palladium and cyanotype prints. A native North Carolinian, Diana currently lives and works in Raleigh, North Carolina. She works as an independent curator and has organized and curated several pinhole and alternative process exhibitions, including “Pure Light: Southern Pinhole Photography,” shown at the Southeastern Center for Contemporary Art (SECCA), in Winston-Salem, NC in 2004. The exhibit, “Old is New Again: Alternative Processes,” which was originally shown at the Green Hill Center for NC Art, in Greensboro, NC, was invited for exhibition at the 2004 Pingyao International Photography Festival, in Pingyao, China. She was also an invited artist to the first Qinghai International Photography Festival, in Xining, China, where she exhibited in the summer of 2006. 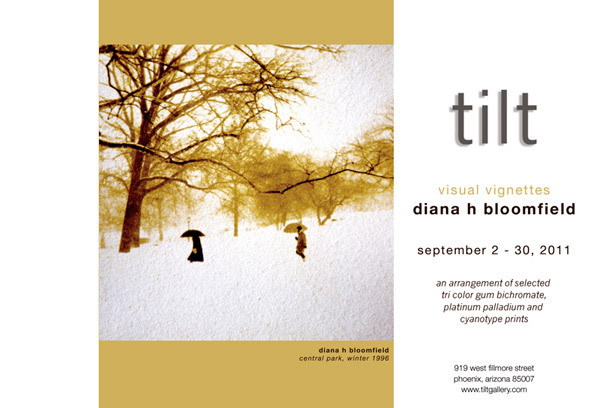 Diana Bloomfield has been an exhibiting photographer for over 25 years. She has received numerous awards for her images, including a 1985 New Jersey State Visual Arts Fellowship, and several Regional Artist Grants from the United Arts of Raleigh, NC, most recently for 2006-07. Her photographs have been included in Pinhole Photography: Rediscovering a Historic Technique (3rd Edition), by Eric Renner; in Malin Fabbri’s Alternative Photography: Art and Artists: Edition I; and in Robert Hirsch’s Exploring Color Photography Fifth Edition: From Film to Pixels (2011). Her work has also been included in the Pinhole Journal; The Post Factory Journal; Chinese Photography; Camera Arts; The Sun; and, most recently, in Diffusion magazine (Volume II, April 2010).